Viking Technology has started shipping their new lineup of ultra high capacity (UHC) SSDs designed to replace 3.5” HDDs in capacity-demanding applications that can take advantage of flash memory. The Viking UHC-Silo drives use planar eMLC NAND memory in custom packaging with raw NAND capacities of 25 TB and 50 TB, and consequently are currently the highest capacity SSDs available on the market. An increasing number of datacenters these days use both SSDs and HDDs, balancing the high performance of SSDs with HDDs' ability to store huge amounts of data relatively cheaply. Meanwhile, there is an emerging category of all-flash or hybrid storage systems that either do not use hard drives at all, or use HDDs mostly for things like “cold” archives. Such systems are rather energy efficient and offer high performance thanks to the heavy use of solid state storage. Nevertheless, when it comes to bulk storage, their requirements are similar to the requirements of datacenters using HDDs: maximum capacity per cubic meter, maximum capacity per watt, high availability, and predictable cost per GB. Viking’s UHC-Silo SSDs were designed for the aforementioned kinds of applications — in some cases, they are going to replace hard drives for huge databases or even “cold” storage, in other cases they are going to sit between “warm” and “cold” storage. Given that many applications may benefit from SSDs, demand for high-capacity flash storage devices is growing in general. 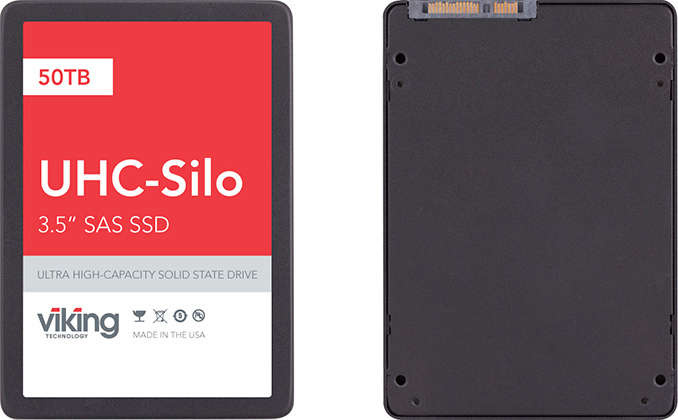 The Viking UHC-Silo SSDs come in a 3.5” form-factor (a rarity for any kind of SSD) and utilize a SAS 6 Gbps interface, two features that make the drives particularly well-suited for replacing high capacity HDDs. The drives are designed for mixed workloads that do not generate more than 1 DWPD and do not require very high performance. 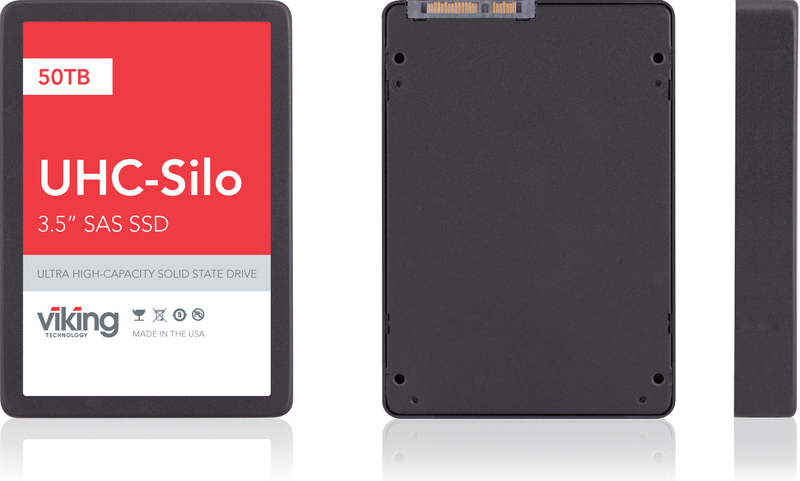 The UHC-Silo SSDs offer sustained sequential read/write speed of 500/350 MB/s as well as up to 60,000/15,000 random read/write IOPS, which is in line with other extreme capacity SATA SSDs and is a result of their internal architecture and limitations of contemporary controllers. In fact, given the UHC-Silo's performance limitations (350 MB/s sustained write speed), it's impossible to write more than 30 TB of data in a single day. So while the 25 TB version can physically support 1 DWPD over five years (this is what Viking guarantees), the 50 TB model cannot physically support more than 0.6 DWPD. The latter fact essentially means that, assuming Viking's sustained performance figures are reasonably accurate, the TBW rating of the 50 TB SKU (91.25 PB) cannot be physically exceeded during the warranty period. Customization Options Yes, can add power failure protection, etc. The UHC-Silo drives are based on a custom-built proprietary controller that's paired with eMLC NAND from SK Hynix, which is acquired in wafer form and then cut, tested and packaged in house. In fact, Viking’s proprietary packaging is what enables these drives of rather extreme capacities. SK Hynix officially sells 2048 Gb (256 GB) MLC packages containing 16 128 Gb NAND devices. If Viking used these off-the shelf packages, it would require 100 of them for the 25 TB drive and 200 of them for the 50 TB SSD. Since it is impossible to pack 100 or 200 chips into a 3.5” SSD, Viking uses proprietary NAND packages to build its UHC-Silo drives. The company does not disclose information about its custom NAND chips and does not freely show the internals of the drives because the packaging is one of its key trade secrets. The proprietary controller that Viking uses supports BCH-based 55 bit/512 byte ECC with end-to-end CRC protection to enable a <1 in 1017 bits read bit error rate. The drives also support data recovery from sector, page and block failure, but for some reason the standard versions listed on the company’s web site do not have any power failure data protection. Meanwhile, since such drives are usually bought for a particular project and are built-to-order, clients may ask Viking to add this feature (and not only this) for an additional fee. Viking stresses that the controller supports NAND from different vendors and thus it can switch between suppliers if it needs to. Viking says that its UHC-Silo SSDs are the highest-capacity SSDs available on the market today. From raw capacity standpoint, the UHC-Silo are exactly what Viking claims them to be: nobody else offers 25 and 50 TB SSDs in a 3.5” form-factor. Meanwhile, Viking had to make significant tradeoffs between performance, capacity, power and compatibility, which is why its drives are considerably slower than some of their direct rivals, such as NGD’s Catalina 24 TB SSD (up to 3.9 GB/s throughput) and Samsung’s PM1633a 15.36 TB drive (up to 1.9/0.9 GB/s read/write). Since there are loads of potential customers requiring massive SSDs for their existing 3.5” SAS backplanes, Viking had to use this interface and could design the drives' capabilities around its limitations. But perhaps most surprisingly, despite the industry-leading capacity of their drives, Viking is keeping the overall prices of the drives relatively reasonable. The actual prices of the Viking UHC-Silo SSDs are not published (remember that they can be customized), but the manufacturer says that the two drives are priced at around $0.40 per GB. This would put the 25 TB drive at approximately $10,000, whereas the 50 TB version would run for $20,000. By contrast, the aforementioned Samsung PM1633a 15.36 TB SSD costs ~$11,300, or $0.73 per GB. I'm fairly certain this is not the first time I've seen AnandTech make this mistake before. I think Someone's MacBook has learned the wrong way to spell this and is causing a bad autocorrect. "I have no idea what a DPWD is. Drive Per Write Day?" Yep, that's exactly what it means, as I have elaborated at least twice. DPWD = Donuts Per Working Day? Data Purchased With Donuts? Drives Per Working Dog?